9th century (2nd half), France (Saint-Amand), in Latin. Parchment, gold ink, ornamented frames, initial letters of the «animal» style. Binding of the 17th century: cardboard, dark red gold-embossed leather. Sacramentary – a Catholic liturgical book. Its original text is attributed to Pope Gregory II (715-731), a supporter of use of the Rule of Saint Benedict. 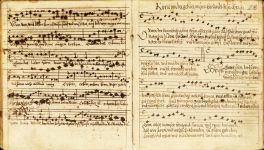 The manuscript includes: a calendar of religious holidays, a list of hymns and litanies (devotions), a list of names of Christian saints; the succession of festive church masses, rites. The book also contains services to Holy Trinity, St. Spirit, Holy Cross, St. Virgin Mary, to general and local saints, celebrated in the temple; as well as everyday, festive and special prayers. 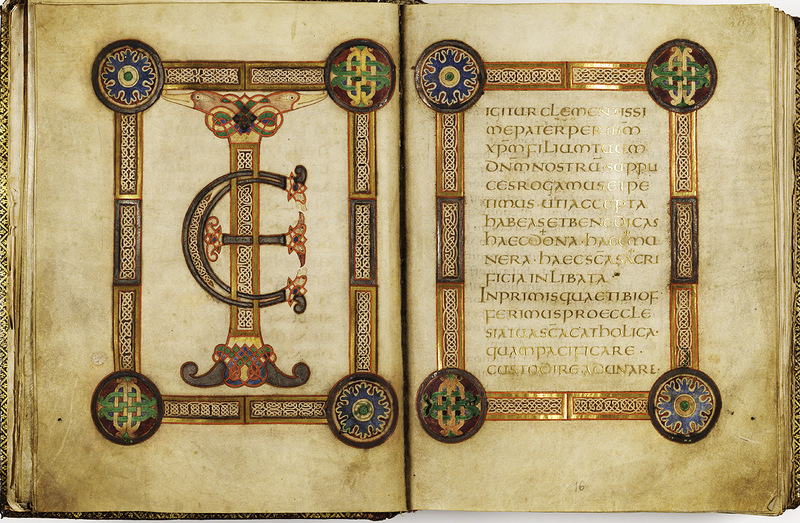 The Sacramentary held in the NLR is among the best liturgical codices created in Carolingian era. The first page of the manuscript is written in gold ink, the text is enclosed in a fine ornamented frames of coloured geometric designs using gold and silver overlay. The decoration of manuscripts (stylized animal figures, braided designs) features elements of Irish and Anglo-Saxon art, introduced by migrants from the islands into the continental scriptoria. 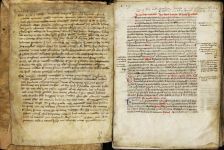 The rich decoration of the manuscript and analysis of names of saints suggest that it was made in the second half of the 9th century in a large monastic scriptorium or court workshop located in the north-eastern France. According to researchers, this can be scriptorium of the Benedictine monastery of Saint-Amand founded in 639 AD in the Diocese of Tournai, which specialized in producing of expensive illuminated manuscripts commissioned by the court. During the Middle Ages, the manuscript belonged to the Benedictine Abbey Perrecy within the diocese of Bourges. In 1756, J.A. Załuski acquired the book in Paris for 40 louis. Sermons; Pope Innocent III. About Contempt for the World; Albertanus of Brescia. About the Ability to Speak and be Silent, and others. Binding of the 13th century: boards, leather. Moralium dogma philosophorum; Innocentius III, papa (1161-1216). 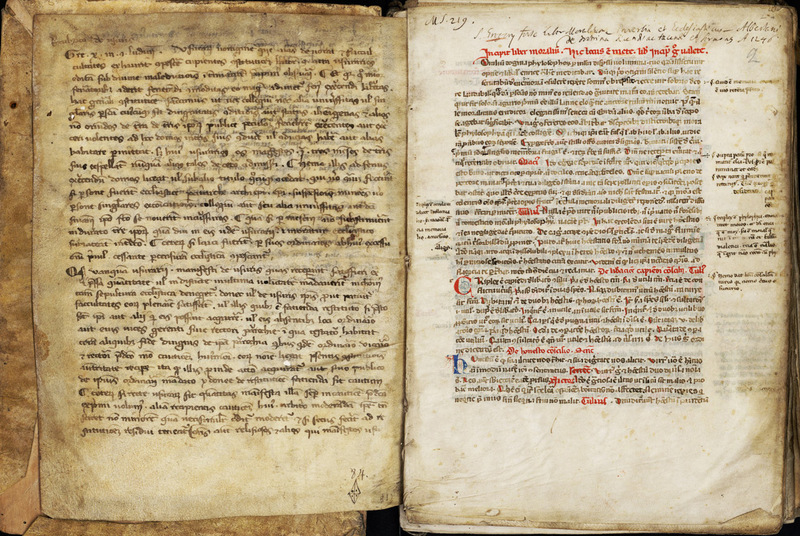 De miseria humanae conditiones; Bernardus Papiensis (са 1150-1213). Sermones editi a domino Papiensi episcopo; Albertanus Brixiensis (са 1190-1250). De doctrina dicendi et tacendi, et. al. The miscellany contains moralizing treatises of Italian medieval theologians, including Pope Innocent III, Albertanus of Brescia, Childebert of Tours, Peter Damian, as well as quotations from the Bible and sermons. 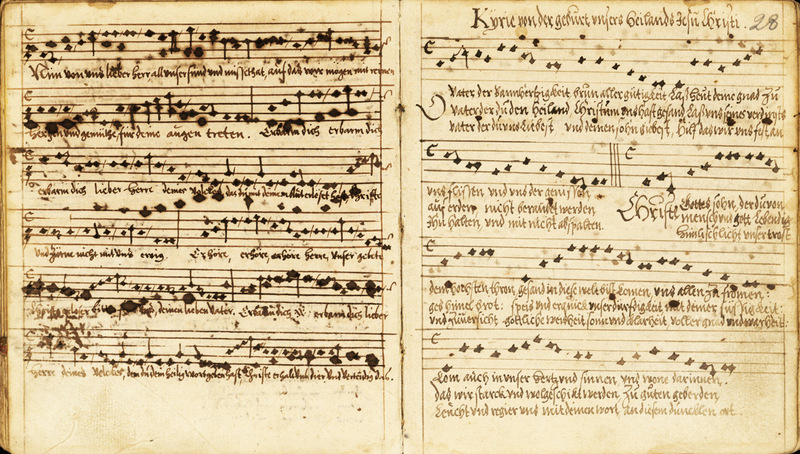 The manuscript may have been created in Italy by scholars - theologians. Its extant original binding of the thirteenth century, made of boards covered with rough leather, lends still greater importance to the manuscript. Late 16th century, Holland, in the Dutch language. 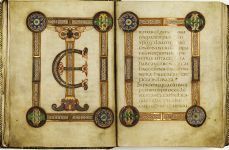 Parchment, colourful ornamented initial letters with gold, border. Binding is contemporary with the manuscript: boards, leather. 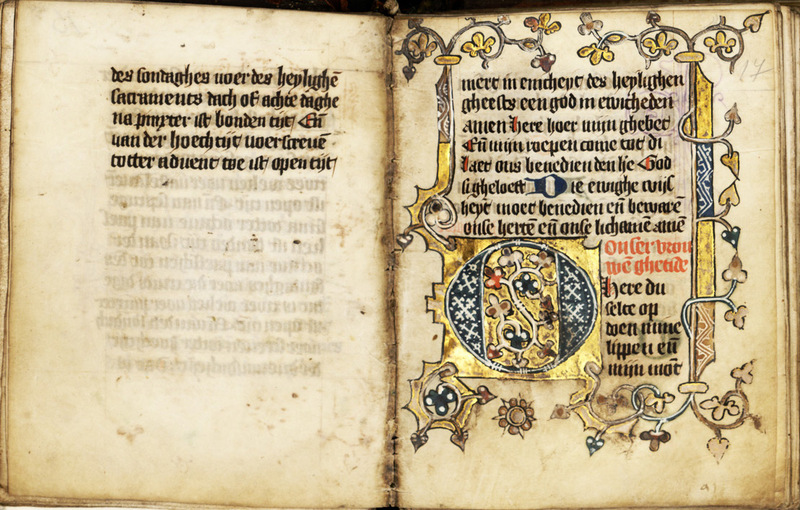 The Book of Hours – a book, intended for family and individual use of laymen. It contains a calendar, daily prayers and the prayers to the saints. 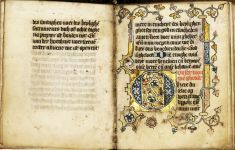 The handwritten Book of Hours was created at the late 16th century in Holland and was decorated with ornamented initials with gold overlay. 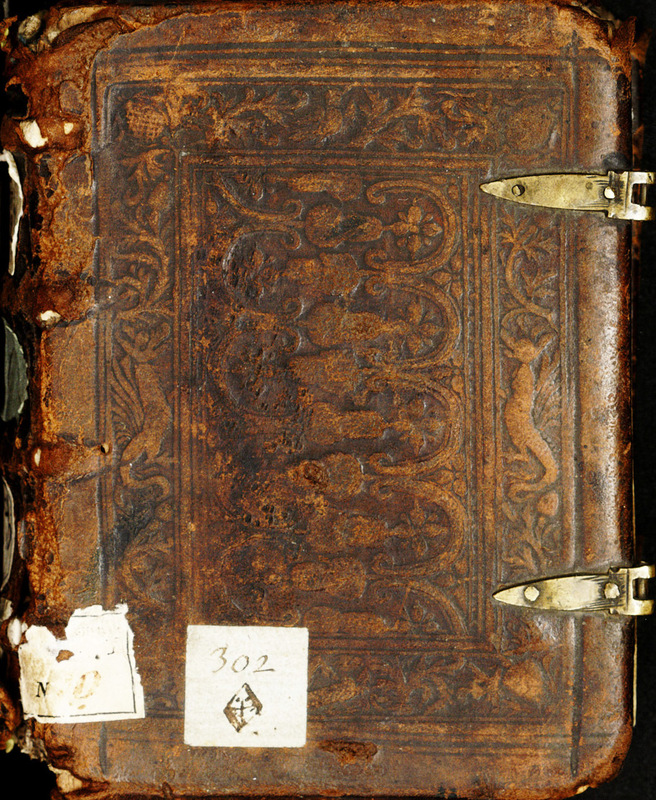 The original binding with fragments of metal fasteners is well preserved. Etliche Collecten auff alle Sontage und vornembsten Fest durch das gant­ze Jar. Collection of prayers for Sundays and special holidays. 17th century, Germany, in the German language. Square notation, vocal parts. 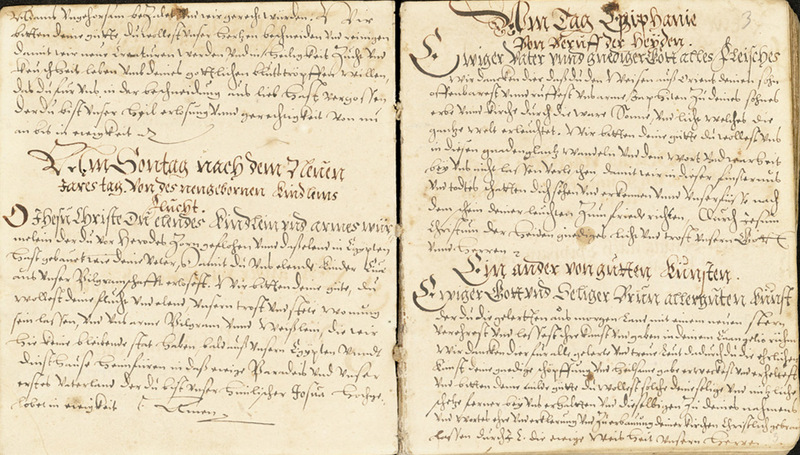 It is a collection of prayers for Sundays and special holidays, compiled by the German theologian Johannes Mathesius in the mid 16th century. The handwritten list from the Załuski collection dates to the 17th century. There are written hymns at the end of the text. The original binding of the manuscript has been lost, but there is a label with a special character in the form of diamond, stamped by a librarian, which confirms the origin of the manuscript from the famous library and its special value.